When I was a kid, my family did a fair amount of camping. It was about this time that I developed my near religious love for the great outdoors. We went up and down California with our tent and sleeping bags, hiked up mountains, swam in high altitude lakes and came to believe (mistakenly I now know) that the word forest, by definition, referred only to evergreens. Now, despite all the passing years, my memories are still full of the smell of pine, the soft crunch of needles under my feet and the occasional revelation of a natural wonder. I don’t quite know how my mom was able to pull it off on our motley collection of Coleman cooking equipment, but we had casseroles, stews and pies that most people would be hard-pressed to make at home. At one point my wife and I cooked three months worth of meals on our backyard barbecue, but that pales in comparison to the burners of a pump-fuel camp stove on the bare ground or atop a dirty old picnic table with or without the thin metal box which converts the stove to an oven. As kids, we didn’t really think much about it. We had more important things to do: like scooting over giant logs that had fallen across streams, catching frogs/snakes/lizards/newts/(i.e. whatever fauna we could find), and annoying each other. It’s not too different from the way my own kids behave, even without the benefits of mountain air. I’m not exactly sure when, but Camp Stew had its origins in a campground in Weaverville, CA. I’m also not exactly sure where that is anymore, but I do know that we found the spot because we had to abandon our chosen campground in Lassen Volcanic National Park due to a surprise snow storm that we learned of early one morning when it began dripping through the roof of our tent. Just another summer in California! From what I remember, the stew had big chunks of beef, carrots, onions, potatoes, some stock, and maybe some herbs and vegetables. Like I said, I wasn’t all that involved with the cooking back then. As a result, this is more of a general approximation than an exact replica. Sue me. At least it’s camp style. As you’ve seen over the course of this blog, my kids have enjoyed most of the same meals I grew up on (taco night, tamale pie, spaghetti), with the exception of tuna noodle casserole (sorry, Mom). But this was the first time I’d ever made them Camp Stew. As expected, they ate it right up. For me it was a trip back to my childhood, only this time I brought my own kids along. Isn’t that pretty much what we all do as parents? Start with a foundation of everything we love about our lives and build up from there. Okay, so maybe it’s not true Camp Stew if it’s not cooked on a Coleman stove. But when the temperature is 25°F, camping is strictly optional. Heat the oil over medium heat in a 3 quart soup pot, add the onions and beef, and continue to cook until the onions turn clear and the meat is browned. Next add the carrots, potatoes, Brussels sprouts, thyme, stock and seasonings, bring to a boil, then reduce to a simmer, cover and continue to cook for an hour or two. That’s it. The long slow cooking is the key. It goes great with crusty bread and butter and a roaring campfire. Image Credit: “Camp Cooking,” photographed by the author. There is something about cooking food outside that makes it taste better. There are, of course, exceptions, like when your hotdog falls in the ashes or your marshmallow gets burned beyond recognition. It doesn’t happen so much during a Midwestern winter. 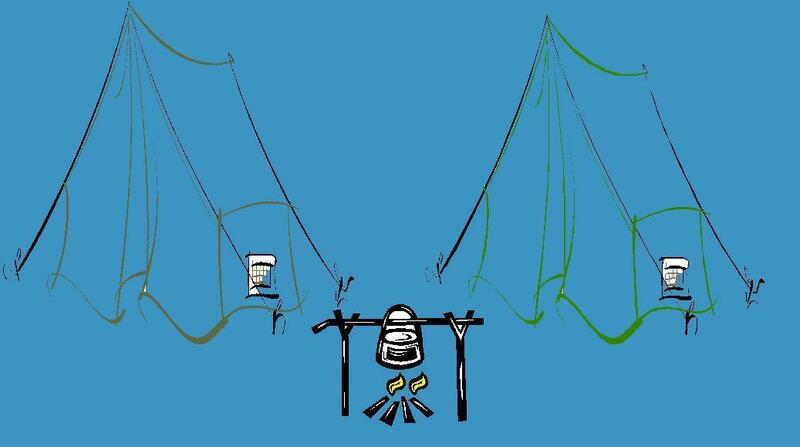 If you have a camp cooking memory, please leave a comment about it. It would at least warm my heart. I’ll be reading and responding. If you could only incorporate the smells that accompanied those memories, I would have been completely transported back to East Weaver Campground… Excellent post! Thanks for comment. It’s funny the way some things can transport you back to a place. I’ll bet a bowl of the stew would make the feelings even stronger. I’m glad you’re still reading these things. I have great memories of those days, too, Phil. Especially the blackberry pie. I told all of you that I would make the pie if you’d pick the wild blackberries. I rolled out the crust using a large thermos bottle and baked it in that Coleman oven. I guess it must have been the location…it sure tasted better than anything I’d made at home. I’d forgotten about the thermos rolling pin. That’s a great image. The oven itself was enough of a challenge.